Are you looking for an application to see your Biorhythms and find out your physical, emotional, intellectual and intuitive status? It’s quite natural that our body and the mind act differently each and every day. Sometimes it’s healthy, happy, energetic and sometimes feel so tired and has different mood swings. Still, we do our daily routine activities in spite of being incapable. That’s totally unfair with our body. So, Biorhythms is the correct way to analyze the way your mind and body act on a particular day. It can be calculated via different applications available on the Market but if you’re an Apple user then, there is an app which will be best suited for checking Biorhythms daily and plan your future also. It’s known as “Biorhythm”. Developed by Jeonghwan Kim on September, 26, 2017, this app can be used on iPhone, iPod touch and iPad having iOS 8.0 or any later version of the OS. All you need is to pay a small amount of money @ $1.99 and get it from the iTunes Store. Biorhythms is the physiological cycle of 4 things, i.e. Physical, emotional, Intellectual and intuitive rhythms. These cycles repeat in uniform pattern based on your birthday. This theory was summarized by Dr. Wilhelm Fliess of Germany in the 19th century. Biorhythms basically predicts your life’s events and you can adjust your daily life activities according to the value of your Biorhythms so that you can perform well in your life. If you’re physically feeling low or high, then you can plan your routine accordingly in any field, whether it is learning, sports and sales. This is the actual benefit of using a biorhythm app. 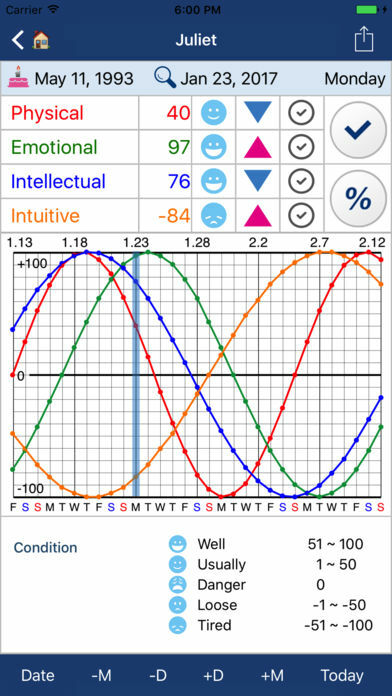 Biorhythm app is very easy to learn and use, and it’s based on various calculations which determines how much of a percent you’re today. It represents the data through values as well as graphs. It also provides integrated management of multiple users’ Biorhythms which means that you can check biorhythms of many people side by side to a time. It also calculates the average of two or more users’ Biorhythms. You can send them Biorhythms using messages or email also. This app is the most trusted Biorhythms apps on the Market and it provides accurate data. Unlike other apps, it’s easy to use and the simplest app to check Biorhythms online. Moreover, it’s well organized and managed properly. 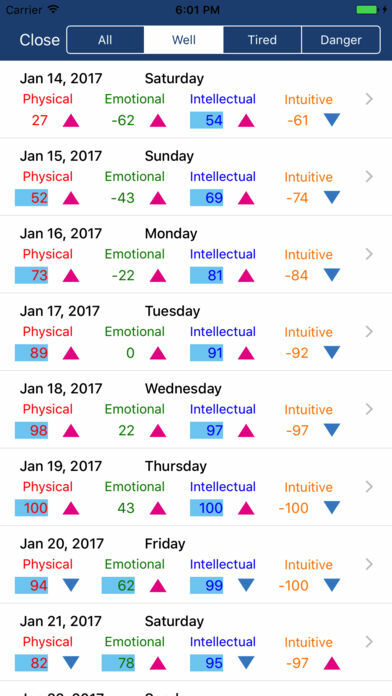 If you’re still confused about using the app then you can try it by checking the Biorhythms of a particular day in the past about which you know and see the results. Maybe it will surprise you! So, have a look at the Biorhythms app and advise your future! 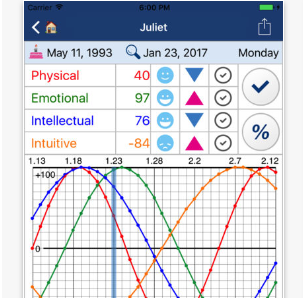 Pros: best app to check Biorhythms; simple to use; represents 4 cycles through graphs; integrate with multiple people; calculate Biorhythms through your birth date or any particular date; the intuitive UI; share reports via email or messages; plan your activities to be held in the future; brilliant app.